Once thought by anthropologists to be nothing more than ‘amusing liquid containers’, the Peruvian whistling vessels are now telling their true story to anyone who is ready to listen. Andean creation legends say that the creator made the first men and women from clay which was then breathed into to form the first life on Earth. Alpamasca, the Inca word for a person’s body means ‘animated earth’. For centuries, archaeologists were finding these vessels at many burial sites and sacred places, but their meaning and use was shrouded in mystery for centuries. In recent years their story is being discovered and they are once again being used for journeying to other realms as well as helping to improve health and well-being. Some of the oldest whistles have been dated at around 500 – 300BC and were made by the Vicus and Salinar people. The most commonly found are Moche, Chimu and Inca in origin and date from 1000 AD until shortly after the Spanish conquest in 1532. The vessels are usually made in the shape of animals, people or mythical figures. Sound has long been associated with shifting consciousness and enabling the player or listener to contact other realms, nature and the different aspects of self. Acoustically the whistles are very interesting. The sound they produce is high pitched and similar to that of the old whistling kettles. When played on their own they sound rather uninteresting but when combined with groups of whistles it becomes clear why they were made in this way. People who have heard groups of whistles being played report hearing a buzzing sound that seems to come from inside their head and their eardrums are being vibrated. Every sound we hear produces minute vibrations on the surface of the eardrum which in turn are translated into nerve impulses which the brain decodes. The pitches of each vessel are almost identical but the minute differences in pitch produce a psycho-acoustic effect that has been likened to ‘sonic ayahuasca’. Very close-matched sounds create multiple sets of ripples across the eardrum which the brain attempts to make sense of. The brain registers each sound separately but also perceives other sounds which appear to come from inside the head. This effect increases when a greater number of whistles are played until there is a build up of different buzzing sounds and pulses both inside and outside the head. This phenomenon is the key that unlocks the doorway to other realms. 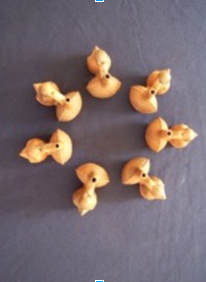 The whistles are made so that the sound-hole is level with the third eye as you play (which in itself is extremely interesting as this further highlights that the makers of these wonderful vessels fully intended to use the sound to alter consciousness). The importance of the breath also features heavily in many cultures throughout the world. Life-force/chi/prana/vital energy is taken into the body on the breath. The player of a vessel is required to be attentive to the direction of their breath to enable their whistle to produce the best beating sounds. The slow, directed breath allows the player to relax and helps them to journey with the sound. It is also necessary for the player to listen to the other players in the group, therefore becoming less conscious of ‘self’ and more aware of the group energy. Even if you are not playing, the sounds can still produce amazing effects and receivers have also had powerful experiences. One listener reported shape-shifting into a black panther and prowling around the group on all fours until coming back to the ‘here and now’. This experience proves that you don’t have to be playing to receive the effect of these wonderful tools of transformation. Other players have been transported to the stars, taken deep inside the Earth and had conversations with spirit guides or relatives that have passed into spirit. There are too many experiences to mention in this article, but suffice to say that I am very respectful of the potential that the vessels hold within them. It is very rare for a person not to have an experience with the whistling vessels but some people find that they need a few sittings with them until they have got used to the sound and feel comfortable. It is also important that a safe and supported sacred space is created before working in this way. Not every sound is for every body and some people do not like the piercing sound of the vessels or are not comfortable with the consciousness shifting effects that the whistles facilitate. My personal journey with the whistling vessels began when I came across a copy of Daniel Statnekov’s book, ‘Animated Earth’. I had been working with sound for many years and after reading this book I knew that I had to experience the whistling vessels first-hand. I contacted Daniel Statnekov in the USA and spoke about my passion for sound and the desire to work with the whistles. Following a long telephone conversation he informed me that he would be happy to make a set for me. Over the next few months I received regular updates from Daniel regarding the progress of my vessels. He asked if I would like to contribute something to the fabric of the vessels so I sent a piece of quartz crystal which I had lovingly programmed and ground up for him to add to the special clay mixture that has taken him years to perfect. The making of each vessel is a sacred process and once fired, the whistles were left outdoors to be energised by the elements. A month or so later I found myself sitting in the living room of a house in San Francisco where I was to receive my first introduction to the power of the vessels. In the centre of the room sat fourteen vessels arranged in a circle upon a rug. 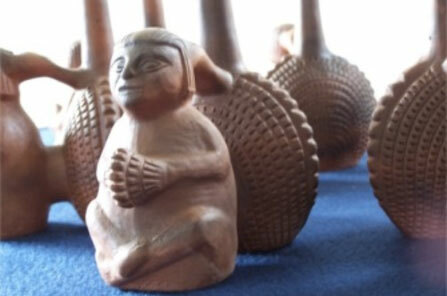 The vessels were replicas of a Chimu whistling vessel (picture attached). The Chimu kingdom stretched for more than six hundred miles along the northwest coast of what is now known as Peru. The Chimu were an extensive civilisation with a highly developed agricultural, artistic and political state. After a few minutes of playing I felt a strong tug on my solar plexus as if someone had attached a string to it and was pulling fairly hard. In my mind’s eye I saw a black hole open in front of me and my solar plexus lurched as if I had just gone over a hump-back bridge at speed. After a moment’s hesitation I took the plunge and went in. It was like travelling down a wormhole at a tremendous speed for a few seconds and then suddenly I was spat out of the other end into silence and bliss. Every molecule of my being felt as though it was disconnected from ‘self’ and yet profoundly connected to all that is. I felt expansive, light and full of love and peace. I was not aware of the room that my physical body was still sitting in although in the distance I heard a faint sound of the whistling vessels being played. This sound reassured me part of me was still ‘attached’ to the room. It felt as though I had phased-out of one dimension and into another where peace and tranquillity reigned supreme. A few minutes later I snapped back into the dimension that I presently call ‘home’ and became aware of the room and the people around me. 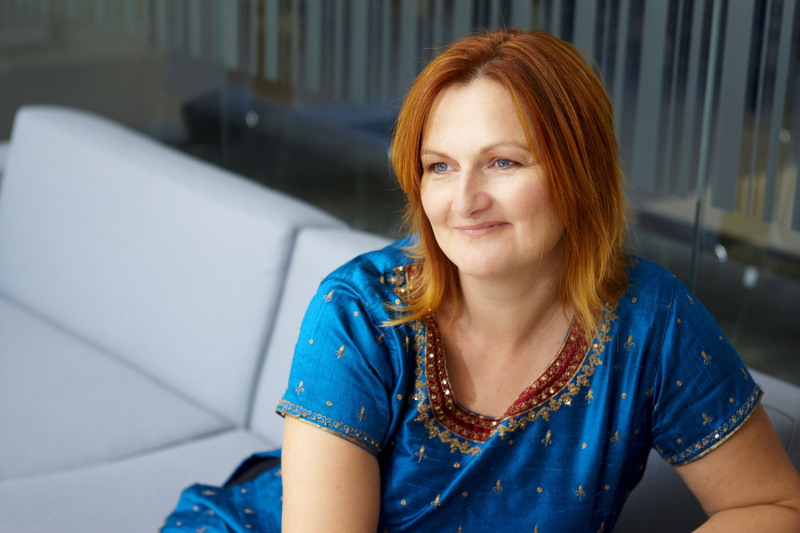 I took a while to ground myself, but afterwards felt refreshed, centred and energised. Working with sound in this way can be a powerful sacred experience and can open doorways to exploring the self and other realms. My experience is that the whistles have an accumulative effect and the more you use them, the easier and quicker it is to enter back into an altered state. I always work with the vessels in a mindful, sacred way. Working with them at a sacred site such as Stonehenge can be extremely powerful as the interaction between the energy of the sound and the energy of the earth adds a special quality. Working in caves or places with lively acoustics such as churches and temples is also a very special experience. All of my tools are treated with respect and therefore the more they are used, the more the energy within them grows. If I am running a workshop I usually build towards playing the vessels close to the end of the day or weekend so that people have had time to adjust to working with sound in a transformational way. Himalayan singing bowls, voice, drums, gongs and crystal bowls are among the instruments that are used along with breath and gentle movement to help to raise frequencies and transmute denser energy that can hold us in dis-ease. The sound and energy of each instrument interacts with each person in a different way and therefore everyone’s experience and feedback will be different. As each individual’s frequencies become lighter so they are able to assimilate the sound in a deeper way. Towards the end of the day we may travel to the sacred site or sometimes the whole workshop is conducted within the space. The whistles are played and the group take it in turns to give and receive their song. A session of playing can last from 20 minutes to an hour depending on the participants. After a workshop such as this it is so important to make sure everyone is grounded in the ‘here and now’ so we make sure we integrate some grounding exercises before saying goodbye.